So if you block the morphine receptors in your brain with a drug, then you can actually eat less. Because these people who are eating and they have the morphine receptors blocked, the only reason they’re eating is because they’re hungry. If your morphine receptors aren’t blocked by naltrexone, you’re eating because of the little high, because it gives you kind of a pleasurable feeling when you eat. And you may think that sounds good, “I like to eat food that makes me feel good.” But it’s just like a smoker with the nicotine; they like to smoke because smoking makes them feel good. The problem is, two hours later you go through withdrawals. The same thing that makes you feel good is what makes you feel bad, what makes you feel hungry two hour later. In fact, there are some drug companies that are trying to develop naltrexone into a new miracle diet pill. But the problem is, when you give people naltrexone, chronically, they get depressed. Because the naltrexone blocks the morphine-like exorphins from the wheat in your brain but it also blocks your normal, natural endorphins. And endorphins are what your body releases when you feel good about something or when you have pleasure. When you exercise, you release endorphins. So they’re gonna combine the naltrexone with an antidepressant, right? 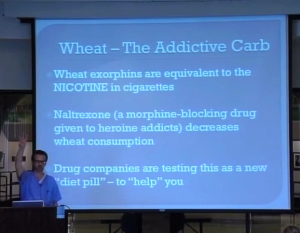 That way you can eat the wheat, which is an addictive drug; you can take the naltrexone so you don’t take too much wheat; and you can take the antidepressant so you don’t feel too depressed from the naltrexone. And that kind of shows, that’s a problem with medicine and kind of with society, is that you kind of end up going down this path, and the path is the pills-after-pills-after-pills-after-pills path. If you have twenty problems, your doctor will put you on 20 pills. I’m an ophthalmologist and I do cataract surgery, so my patients are in the age of 65-85. And I can’t tell you how many patients have walked through the door, and they have a list of medications that’s 15 medications long. Fifteen prescription medications they take each and every day of their life. And that’s what I want to save you from. If you can get rid of just one medication, that would thrill me. Sir William Osler, the Father of Modern Medicine, he said, “One of the first duties of the physician is to educate the masses not to take medicine.” That’s what we’re here for. So for all those patients who came into the clinic, we look at their list of 15 medicines. All the patients who came to the Internal Medicine clinic, I would look at their list of 15 medicines and see which one we can possibly take them off. 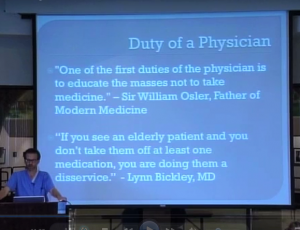 As an ophthalmologist, I do cataract surgery and I don’t mess with other people’s medications. And the reason is because I’m not the one managing your diabetes, I’m not the one managing your blood pressure. That’s why you need to see your doctor. 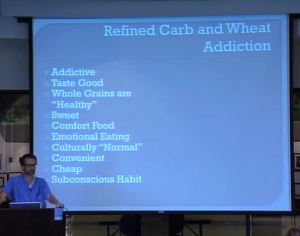 So why do we eat so much of these refined carbohydrates? We already talked about their being addictive. Number two, they taste good. And that’s an interesting point. I can’t deny that sugar tastes good and bread tastes good and cakes and cookies and pies all taste good. But the question is, if i told you arsenic tasted like chocolate, would you eat it? Cyanide is a poison that will kill you instantly. And cyanide smells like almonds. If I told you cyanide tasted like almonds, would you take it? The answer is No. Cyanide actually naturally occurs in the pit of the wild cherry. If I told you that cyanide tasted like wild cherries, would you take it? No. So the excuse that you run in your mind that, “Well, it tastes good. I like to eat things that taste good.” No, you don’t. Because if cyanide tasted good, you wouldn’t eat it. You would recognize it’s a poison. Another thing is that we’ve been told whole grains are healthy. Basically, they did studies on hunter-gatherers, and they said, “Well, look, they don’t get any of these diseases. Why don’t they get the diseases? Well that’s because they have more fiber in their diet.” And so they said, “Well, you Americans need to eat more fiber so we don’t get these diseases like diabetes and obesity and colon cancer.” But the problem is, these people they studied, these hunter-gatherers they studied, they didn’t get their fiber from wheat; they didn’t get their fiber from cereal grains. They get their fiber from vegetables, fruits, and nuts. So the American Dietetic Science community said, “You need to eat more fiber.” What’s the easiest way to eat more fiber? You take white flour and you turn it into whole wheat flour. Now you got more fiber. But the people we actually studied were people who ate fruits, vegetables and nuts. That’s where they got their fiber. They’re sweet, they’re comfort food, there’s emotional eating. It’s normal – normal to have a hamburger between two buns, right? So for you or for me to get to the point that I no longer have a hamburger between two buns takes a little bit of a change. They’re convenient, they’re cheap, and they’re a subconscious habit. We’ll talk about the subconscious mind a little bit later. So if they’re harmful, why do we eat so many? The number one reason was that they’re addictive; number two, they taste good. Number three, they’re cheap. Breads, cookies and cakes, things like that, they’re some of the cheapest foods that you can buy. Breakfast cereals, you go down the breakfast cereal aisle, it’s a big box like this and it’s only $4.